This article is about the electronic vacuum tube. For the Eastern Orthodox structure of hymns, see Triodion. The 3CX1500A7, a modern 1.5 kW power triode used in radio transmitters. The cylindrical structure is a heat sink attached to the plate, through which air is blown during operation. De Forest Audion tube from 1908, the first triode. The flat plate is visible at top, with the zigzag wire grid under it. The filament was originally under the grid but has burned out. Before thermionic valves were invented, Philipp Lenard used the principle of grid control while conducting photoelectric experiments in 1902. The first vacuum tube used in radio was the thermionic diode or Fleming valve, invented by John Ambrose Fleming in 1904 as a detector for radio receivers. It was an evacuated glass bulb containing two electrodes, a heated filament and a plate (anode). Triodes came about in 1906 when American engineer Lee De Forest and Austrian physicist Robert von Lieben independently patented tubes that added a third electrode, a grid, between the filament and plate to control current. Von Lieben's partially-evacuated three-element tube, patented in March 1906, contained a trace of mercury vapor and was intended to amplify weak telephone signals. Starting in October 1906 De Forest patented a number of three-element tube designs by adding an electrode to the diode, which he called Audions, intended to be used as radio detectors. The one which became the design of the triode, in which the grid was located between the filament and plate, was patented January 29, 1907. Like the von Lieben vacuum tube, De Forest's Audions were incompletely evacuated and contained some gas at low pressure. von Lieben's vacuum tube did not see much development due to his death 7 years after he invented it at the outbreak of World War I. De Forest's Audion did not see much use until its ability to amplify was recognized around 1912 by several researchers, who used it to build the first successful amplifying radio receivers and electronic oscillators. The many uses for amplification motivated its rapid development. 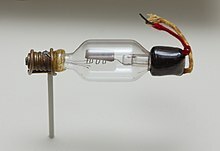 By 1913 improved versions with higher vacuum were developed by Harold Arnold at American Telephone and Telegraph Company, which had purchased the rights to the Audion from De Forest, and Irving Langmuir at General Electric, who named his tube the "Pliotron", These were the first vacuum tube triodes. The name "triode" appeared later, when it became necessary to distinguish it from other kinds of vacuum tubes with more or fewer elements (e.g. diodes, tetrodes, pentodes, etc.). There were lengthy lawsuits between De Forest and von Lieben, and De Forest and the Marconi Company, who represented John Ambrose Fleming, the inventor of the diode. The discovery of the triode's amplifying ability in 1912 revolutionized electrical technology, creating the new field of electronics, the technology of active (amplifying) electrical devices. The triode was immediately applied to many areas of communication. Triode "continuous wave" radio transmitters replaced the cumbersome inefficient "damped wave" spark gap transmitters, allowing the transmission of sound by amplitude modulation (AM). Amplifying triode radio receivers, which had the power to drive loudspeakers, replaced weak crystal radios, which had to be listened to with earphones, allowing families to listen together. This resulted in the evolution of radio from a commercial message service to the first mass communication medium, with the beginning of radio broadcasting around 1920. Triodes made transcontinental telephone service possible. Vacuum tube triode repeaters, invented at Bell Telephone after its purchase of the Audion rights, allowed telephone calls to travel beyond the unamplified limit of about 800 miles. The opening by Bell of the first transcontinental telephone line was celebrated 3 years later, on January 25, 1915. Other inventions made possible by the triode were television, public address systems, electric phonographs, and talking motion pictures. The triode served as the technological base from which later vacuum tubes developed, such as the tetrode (Walter Schottky, 1916) and pentode (Gilles Holst and Bernardus Dominicus Hubertus Tellegen, 1926), which remedied some of the shortcomings of the triode detailed below. 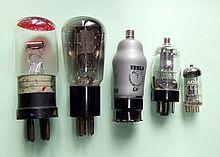 The triode was very widely used in consumer electronics such as radios, televisions, and audio systems until it was replaced in the 1960s by the transistor, invented in 1947, which brought the "vacuum tube era" introduced by the triode to a close. Today triodes are mostly used in high-power applications for which solid state semiconductor devices are unsuitable, such as radio transmitters and industrial heating equipment. However, more recently the triode and other vacuum tube devices have been experiencing a resurgence and comeback in high fidelity audio and musical equipment. They also remain in use as vacuum fluorescent displays (VFDs), which come in a variety of implementations but all are essentially triode devices. Structure of a modern low-power triode vacuum tube. The glass and outer electrodes are shown partly cut away to reveal the construction. Schematic symbol used in circuit diagrams for a triode, showing symbols for electrodes. All triodes have a hot cathode electrode heated by a filament, which releases electrons, and a flat metal plate electrode to which the electrons are attracted, with a grid consisting of a screen of wires between them to control the current. These are sealed inside a glass container from which the air has been removed to a high vacuum, about 10−9 atm. Since the filament eventually burns out, the tube has a limited lifetime and is made as a replaceable unit; the electrodes are attached to terminal pins which plug into a socket. The operating lifetime of a triode is about 2000 hours for small tubes and 10,000 hours for power tubes. Low power triodes have a concentric construction (see drawing right), with the grid and anode as circular or oval cylinders surrounding the cathode. The cathode is a narrow metal tube down the center. 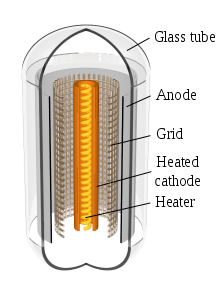 Inside the cathode is a filament called the "heater" consisting of a narrow strip of high resistance tungsten wire, which heats the cathode red-hot (800 - 1000 °C). This type is called an "indirectly heated cathode". The cathode is coated with a mixture of alkaline earth oxides such as calcium and thorium oxide which reduces its work function so it produces more electrons. The grid is constructed of a helix or screen of thin wires surrounding the cathode. The anode is a cylinder or rectangular box of sheet metal surrounding the grid. It is blackened to radiate heat and is often equipped with heat-radiating fins. The electrons travel in a radial direction, from cathode through the grid to the anode. The elements are held in position by mica or ceramic insulators and are supported by stiff wires attached to the base, where the electrodes are brought out to connecting pins. A "getter", a small amount of shiny barium metal evaporated onto the inside of the glass, helps maintain the vacuum by absorbing gas released in the tube over time. High-power triodes generally use a filament which serves as the cathode (a directly heated cathode) because the emission coating on indirectly heated cathodes is destroyed by the higher ion bombardment in power tubes. A thoriated tungsten filament is most often used, in which thorium in the tungsten forms a monolayer on the surface which increases electron emission. These generally run at higher temperatures than indirectly heated cathodes. The envelope of the tube is often made of more durable ceramic rather than glass, and all the materials have higher melting points to withstand higher heat levels produced. Tubes with anode power dissipation over several hundred watts are usually actively cooled; the anode, made of heavy copper, projects through the wall of the tube and is attached to a large external finned metal heat sink which is cooled by forced air or water. 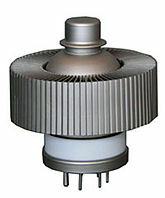 A type of low power triode for use at ultrahigh frequencies (UHF), the "lighthouse" tube, has a planar construction to reduce interelectrode capacitance and lead inductance, which gives it the appearance of a "lighthouse". The disk-shaped cathode, grid and plate form planes up the center of the tube - a little like a sandwich with spaces between the layers. The cathode at the bottom is attached to the tube's pins, but the grid and plate are brought out to low inductance terminals on the upper level of the tube: the grid to a metal ring halfway up, and the plate to a metal button at the top. These are one example of "disk seal" design. Smaller examples dispense with the octal pin base shown in the illustration and rely on contact rings for all connections, including heater and D.C. cathode. As well, high-frequency performance is limited by transit time: the time required for electrons to travel from cathode to anode. Transit time effects are complicated, but one simple effect is input conductance, also known as grid loading. At extreme high frequencies, electrons arriving at the grid may become out of phase with those departing towards the anode. This imbalance of charge causes the grid to exhibit a reactance that is much less than its low-frequency "open circuit" characteristic. Transit time effects are reduced by reduced spacings in the tube. Tubes such as the 416B (a Lighthouse design) and the 7768 (an all-ceramic miniaturised design) are specified for operation to 4 GHz. They feature greatly reduced grid-cathode spacings in the order of 0.1 mm. These greatly reduced grid spacings also give a much higher amplification factor than conventional axial designs. The 7768 has an amplification factor of 225, compared with 100 for the 6AV6 used in domestic radios and about the maximum possible for an axial design. Anode-grid capacitance is not especially low in these designs. The 6AV6 anode-grid capacitance is 2 picofarads (pF), the 7768 has a value of 1.7 pF. The close electrode spacing used in microwave tubes increases capacitances, but this increase is offset by their overall reduced dimensions compared to lower-frequency tubes. Triode with separate cathode and filament. Triode in which filament serves as cathode. In the triode, electrons are released into the tube from the metal cathode by heating it, a process called thermionic emission. The cathode is heated red hot by a separate current flowing through a thin metal filament. In a few triodes, the filament itself is the cathode, while in most the filament heats a separate cathode electrode. Virtually all the air is removed from the tube, so the electrons can move freely. The negative electrons are attracted to the positively charged anode, and flow through the spaces between the grid wires to it, creating a current through the tube from cathode to anode. The magnitude of this current can be controlled by a voltage applied between the cathode and the grid. The grid acts like a gate for the electrons. A more negative voltage on the grid will repel some of the electrons, so fewer get through to the anode, reducing the anode current. A positive voltage on the grid will attract more electrons from the cathode, so more reach the anode, increasing the anode current. Therefore, a low power varying (AC) signal applied to the grid can control a much more powerful anode current, resulting in amplification. Variation in the grid voltage will cause identical proportional variations in the anode current. By placing a suitable load resistance in the anode circuit, the varying current will cause a varying voltage across the resistance which can be much larger than the input voltage variations, resulting in voltage gain. The triode is a normally "on" device; and current flows to the anode with zero voltage on the grid. The anode current is progressively reduced as the grid is made more negative with respect to the cathode. Usually a constant DC voltage ("bias") is applied to the grid to set the DC current through the tube, and the varying signal voltage is superimposed on it. A sufficiently negative voltage on the grid, usually around 3-5 volts in small tubes such as the 6AV6, but as much as –130 volts in early audio power devices such as the '45, will prevent any electrons from getting through to the anode, turning off the anode current. This is called the "cutoff voltage". Since below cutoff the anode current ceases to respond to the grid voltage, the voltage on the grid must remain above the cutoff voltage for faithful (linear) amplification. The triode is similar in operation to the n-channel JFET; it is normally on, and exhibits progressively lower and lower plate current as the grid/gate is pulled increasingly negative of the source/cathode. Cutoff voltage is equivalent to the JFET's pinch-off voltage (Vp)or VGS(off); the point at which current stops flowing entirely. This similarity is limited, however. The triode's anode current is highly dependent on anode voltage as well as grid voltage, causing it to appear as a voltage source in circuit. The JFET's drain current is virtually unaffected by drain voltage, thus it appears as a constant-current device, similar in action to a tetrode or pentode tube. Both the JFET and tetrode/pentode valves offer much higher voltage gains. Although S.G. Brown's Type G Telephone Relay (using a magnetic "earphone" mechanism driving a carbon microphone element) was able to give power amplification and had been in use as early as 1914, it was a purely mechanical device with limited frequency range and fidelity. It was suited only to a limited range of audio frequencies - essentially voice frequencies. The triode was the first non-mechanical device to provide power gain at audio and radio frequencies, and made radio practical. Triodes are used for amplifiers and oscillators. Many types are used only at low to moderate frequency and power levels. Large water-cooled triodes may be used as the final amplifier in radio transmitters, with ratings of thousands of watts. Specialized types of triode ("lighthouse" tubes, with low capacitance between elements) provide useful gain at microwave frequencies. Vacuum tubes are obsolete in mass-marketed consumer electronics, having been overtaken by less expensive transistor-based solid-state devices. However, more recently, vacuum tubes have been making somewhat of a comeback. Triodes continue to be used in certain high-power RF amplifiers and transmitters. While proponents of vacuum tubes claim their superiority in areas such as high-end and professional audio applications, empirical evidence shows that the solid-state MOSFET is virtually identical in performance. In triode datasheets, characteristics linking the anode current (Ia) to anode voltage (Va) and grid voltage (Vg) are usually given. From here, a circuit designer can choose the operating point of the particular triode. In the example characteristic shown on the image, if an anode voltage Va of 200 V and a grid voltage bias of −1 volt are selected, a plate (anode) current of 2.25 mA will be present (using the yellow curve on the graph). Changing the grid voltage will change the plate current; by suitable choice of a plate load resistor, amplification is obtained. VRa = Ia × Ra = 22.5 V if an anode current of Ia = 2.25 mA is chosen. If the input voltage amplitude (at the grid) changes from −1.5 V to −0.5 V (difference of 1 V), the anode current will change from 1.2 to 3.3 mA (see image). This will change the resistor voltage drop from 12 to 33 V (a difference of 21 V). Since the grid voltage changes from −1.5 V to −0.5 V, and the anode resistor voltage drops from 12 to 33 V, an amplification of the signal resulted. The amplification factor is 21: output voltage amplitude divided by input voltage amplitude. ^ Turner, L. B. (1921). Wireless Telegraphy and Telephony. Cambridge University Press. p. 78. ISBN 110762956X. ^ Ginoux, Jean-Marc; Rosetto, Bruno, "The Singing Arc: The oldest memrister?" in Adamatzky, Andrew; Chen, Guanrong (2013). Chaos, CNN, Memristors and Beyond. World Scientific. p. 500. ISBN 9814434817. ^ Burns, Russell W. (2004). Communications: An International History of the Formative Years. London: Institute of Electrical Engineers. p. 339. ISBN 0863413277. ^ Aitken, Hugh G.J. (2014). The Continuous Wave: Technology and American Radio, 1900-1932. Princeton University Press. p. 195. ISBN 1400854601. ^ Fisher, David E.; Fisher, Marshall (1996). Tube: The Invention of Television. Counterpoint. p. 54. ISBN 1887178171. ^ a b c Tyne, Gerald F. J. (September 1943). "The Saga of the Vacuum Tube, Part 6" (PDF). Radio News. Chicago, IL: Ziff-Davis. 30 (3): 26–28, 91. Retrieved November 30, 2016. ^ a b Tyne, Gerald F. J. (November 1943). "The Saga of the Vacuum Tube, Part 8" (PDF). Radio News. Chicago, IL: Ziff-Davis. 30 (5): 26–28. Retrieved November 30, 2016. ^ Hijiya, James A. (1997). Lee de Forest and the Fatherhood of Radio. Lehigh University Press. p. 77. ISBN 0934223238. ^ a b Okamura, Sōgo (1994). History of Electron Tubes. IOS Press. pp. 17–22. ISBN 9051991452. ^ a b c Lee, Thomas H. (2004). Planar Microwave Engineering: A Practical Guide to Theory, Measurement, and Circuits. Cambridge University Press. pp. 13–14. ISBN 0521835267. ^ a b Nebeker, Frederik (2009). Dawn of the Electronic Age: Electrical Technologies in the Shaping of the Modern World, 1914 to 1945. John Wiley & Sons. pp. 14–15. ISBN 0470409746. ^ Hempstead, Colin; William E. Worthington (2005). Encyclopedia of 20th-Century Technology, Vol. 2. Taylor & Francis. p. 643. ISBN 1579584640. ^ Armstrong, E.H. (September 1915). "Some Recent Developments in the Audion Receiver". Proceedings of the IRE. 3 (9): 215–247. doi:10.1109/jrproc.1915.216677. . Republished as Armstrong, E.H. (April 1997). "Some Recent Developments in the Audion Receiver" (PDF). Proceedings of the IEEE. 85 (4): 685–697. doi:10.1109/jproc.1997.573757. Wikimedia Commons has media related to Vacuum triodes. Les lampes radio — A French page on thermionic valves. Of particular interest is the 17-minute video showing the manual production of triodes.